As a child, your life is pretty simple. All that matters in the life of a child is playtime and rest. However, in between the moments of epic play and sound sleeping, children can develop dental problems. As a parent, it is your responsibility to make sure your child is eating a healthy, balanced diet. Children are constantly enticed by large corporations to drink and eat items that have questionable ingredients. One of the worst ingredients your child can consume in abundance is sugar. In this blog, we will discuss the bad effects sugar has on children and how to prevent dental problems by enforcing a healthy diet. Sugar is like a villain that lurks in the shadows; it’s bad for you, but there is a mystery about just how bad it is for you. Well, it has many poor effects on the body. By increasing sugar consumption, you can lower cognitive function, gain weight, increase blood sugar, and rot your teeth. But, if this is all true, why do people still consume so much sugar? It has been claimed by nutrition scientists at Emory University that children between two and 18 should only consume six teaspoons of sugar a day. This amount is about 25 grams of sugar. But, in reality, the average American consumes over 82 grams of sugar a day — that is four times the prescribed amount! But, where is all this sugar coming from? Unfortunately, the reason why the average American consumes so much sugar is from the added sugars in juices, syrups, and sodas. Because Americans aren’t typically too concerned with what they are drinking, large amounts of sugar are passed in things they consume every day. For example, juices are notoriously sugary. It is a common misinterpretation that fruit juice is healthy. However, many fruit juice companies will add additional sugars to the juices to make them more sweet, instead of tart. Because of this, large amounts of sugar as essentially “hidden” in drinks that most Americans aren’t aware of. One of the biggest concerns is how much children are given juices as the healthier option, but all of that juice is really causing multiple health issues. There have been links between sugar and brain development. It has been claimed by researchers at the UNSW Australia that sugar has the same chemical effects on the brain as extreme stress and abuse. Through a collection of rat tests and observations, it was found that the rats who were consuming excessive amounts of sugar, also were suffering from stress issues. Because the rats were responding to the sugar in a stressed out manner, their cortisol levels were increased. Cortisol is also increased in humans during intense stressful episodes or traumatic experiences. Aside from stunning the brain to imitate stress and trauma, sugar is incredibly addictive. In fact, more research on sugar and addiction has been studied at Connecticut College, Princeton University, and the University of Cambridge, all of which confirm that sugar is addictive. In a study conducted at Princeton, it was confirmed that test rats could become dependent on sugar and display common addictive tendencies, such as craving, binging, and withdrawal. The same is no different for humans. We can become dependent on sugar and have withdrawals when sugar is cut from our diets. In America, however, sugar is so ingrained in our everyday life, it can be difficult to cut out additive sugar completely. Sugar is one of the main ingredients that contributes to tooth decay and major dental problems. The more sugar you consume, the more likely you will have cavities or other major dental problems. But, how? Well, when you eat sugar, bits of sugar particles are left in your teeth. Microbes that live naturally in your teeth can latch onto the sugar and develop things, like lactic acid and plaque, that eat away at your teeth’s protective enamel. Without the enamel, your teeth can become infected by bacteria and rotted. When your tooth’s dentin is compromised by bacteria, this means you have a cavity. As many as 91 percent of American adults have cavities that they are not aware of. The more you age, the more likely you will have a cavity or tooth decay. This can be either because the enamel has been worn away or because your sugar intake has increased. It is important that children don’t consume too much sugar in a day. If a child has a sugar-based diet,, their teeth will clearly show signs of decay. Worse, if the cavities are not treated in a child, they can develop into tooth decay. Progressive tooth decay is both painful and expensive to fix. Instead of putting your child at risk for tooth decay and the other risks of excessive sugar consumption, make sure to monitor how much sugar they are eating or drinking daily. Also, it is important to remember that sugar is in almost everything. So, even eating small items, like fruit drinks, will be filled with sugar as well. 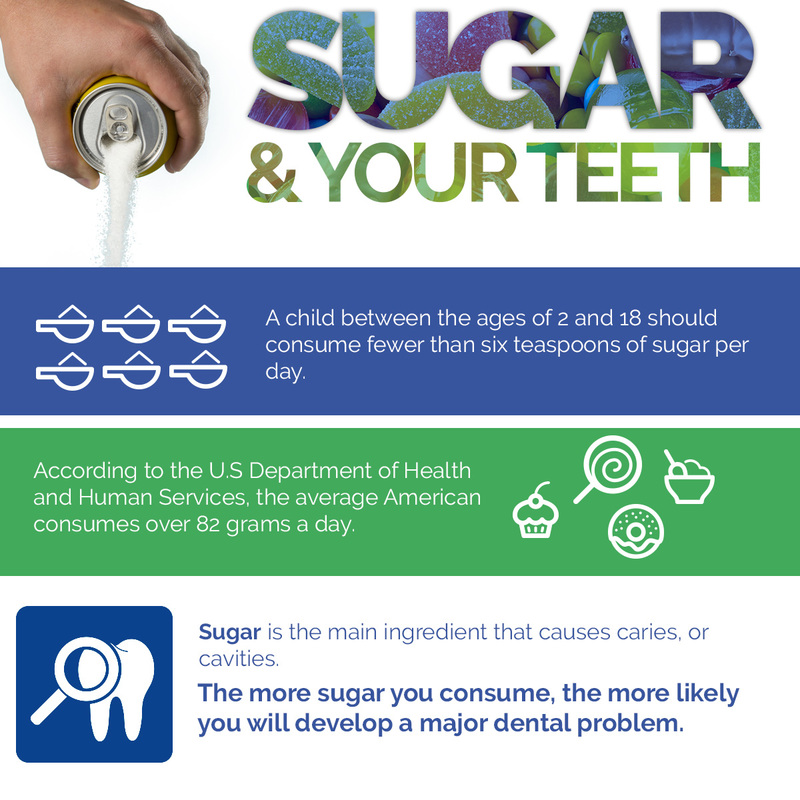 Protect your teeth and your children by cutting back from sugar. If you would like to have your child’s teeth cleaned and inspected, contact us today.